NOTE: NEED 14 DAY NOTICE TO ORDER LINENS UNLESS WE CURRENTLY HAVE IN STOCK. RENTAL PRICES ARE FOR POLY FABRIC. OTHER FABRICS AVAILABLE FOR ADDITIONAL RENTAL PRICE. 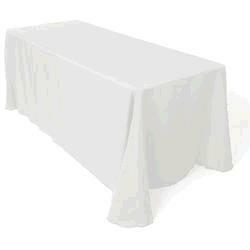 * Please call us for any questions on our 90 inch x 156 inch poly linen rentals in Rocky Mount and Wilson NC.